Courtesy Cosmology and Astroparticle Physics Group University of Geneva. Switzerland Supercomputing Center. Using the Piz Daint supercomputer, cosmologists at the University of Geneva are the first to simulate the structure of the universe in a way that consistently accounts for the general theory of relativity. Piz Daint supercomputer called on to simulate cosmic evolution. Latest models incorporate Einstein's general theory of relativity. Evolution of cosmic structure has little effect on the expansion of the universe. Scientists exploring the universe have at their disposal research facilities such as at Laser Interferometer Gravitational-Wave Observatory (LIGO) — which recently achieved the breakthrough detection of gravitational waves — as well as telescopes and space probes. Considering that the Big Bang does not lend itself to experimental re-enactment, researchers must use supercomputers like the Piz Daint of the Swiss National Supercomputing Center (CSCS) to simulate the evolution of cosmic structures. Hang 10 . The Piz Daint supercomputer calculated 40963 grid points and 67 billion particles to help scientists visualize these gravitational waves. Courtesy Cosmology and Astroparticle Physics Group University of Geneva and the Swiss National Supercomputing Center. This entails modeling a complex, dynamical system that acts at vastly different scales of magnitude and contains a gigantic number of particles. With the help of such simulations, researchers can determine the movement of those particles and hence their formation into structures under the influence of gravitational forces at cosmological scales. To date, simulations like these have been entirely based on Newton’s law of gravitation. Yet this is formulated for classical physics and mechanics. It operates within an absolute space-time, where the cosmic event horizon of the expanding universe does not exist. It is also of no use in describing gravitational waves, or the rotation of space-time known as 'frame-dragging'. Yet in the real expanding universe, space-time is dynamical. And, according to the general theory of relativity, masses such as stars or planets can give it curvature. Led by postdoctoral researcher Julian Adamek and PhD student David Daverio under the supervision of Martin Kunz and Ruth Durrer, the researchers of the Cosmology and Astroparticle Physics Group at the University of Geneva tackled their objective of developing a realistic code. This meant the equations to be solved in the code should make consistent use of the general theory of relativity in cosmic structure evolution simulation, which entails calculating gravitational waves as well as frame-dragging. The research team presents the code and the results in the current issue of the journal Nature Physics. To allow existing simulations to model cosmological structure formation, one needs to calculate approximately how fast the universe would be expanding at any given moment. That result can then be fed into the simulation. “The traditional methods work well for non-relativistic matter such as atomic building blocks and cold dark matter, as well as at a small scale where the cosmos can be considered homogeneous and isotropic,” says Kunz. But given that Newtonian physics knows no cosmic horizon, the method has only limited applicability at large scales or to neutrinos, gravitational waves, and similar relativistic matter. Since this is an approximation to a dynamical system, it may happen that a simulation of the creation of the cosmos shows neutrinos moving at faster-than-light speeds. Such simulations are therefore subject to uncertainty. With the new method the system might now be said to regulate itself and exclude such errors, explains Kunz. In addition, the numerical code can be used for simulating various models that bring into play relativistic sources such as dynamical dark energy, relativistic particles and topological defects, all the way to core collapse supernovae (stellar explosions). There are two parts to the simulation code. David Daverio was instrumental in developing and refining the part named 'LATfield2' to make it perform highly parallel and efficient calculations on a supercomputer. This library manages the basic tools for field-based particle-mesh N-body codes, i.e. the grid spanning the simulation space, the particles and fields acting therein, and the fast Fourier transform necessary for solving the model’s constituent equations, developed largely by Julian Adamek. These equations resulted in the second part of the code, ‘gevolution,’ that ensures the calculations take into account the general theory of relativity. The equations describe interactions between matter, space, and time that describe gravitation in terms of curved four-dimensional space-time. “Key to the simulation are the metrics describing space-time curvature, and the stress-energy tensor describing distribution of matter,” says Kunz. 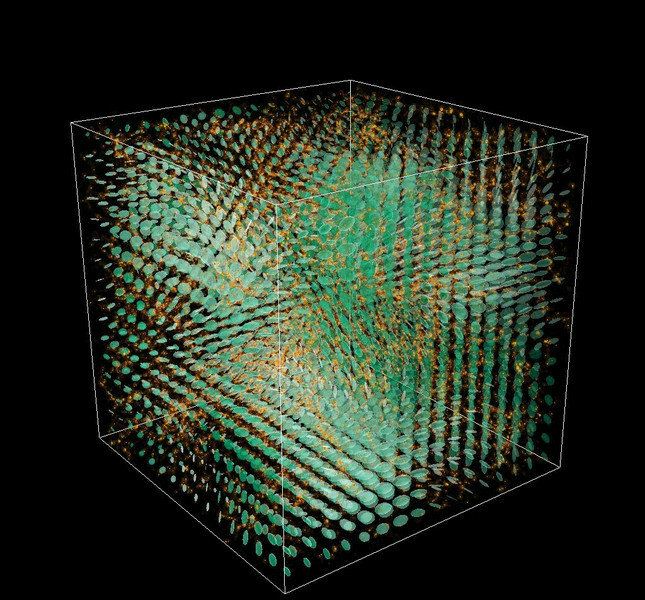 The largest simulation conducted on Piz Daint consisted of a cube with 4,0963 grid points and 67 billion particles. The scientists simulated regions with weak gravitational fields and other weak relativistic effects using the new code. Thus, for the first time it was possible to fully calculate the gravitational waves and rotating space-time induced by structure formation. Spin cycle. A visualization of the rotation of space-time. Courtesy Cosmology and Astroparticle Physics Group University of Geneva and the Swiss National Supercomputing Center. The scientists compared the results with those they computed using a conventional, Newtonian code, and found only minor differences. Accordingly, it appears that structure formation in the universe has little impact on its rate of expansion. With the new method, the researchers have managed — without significantly complicating the computational effort — to consistently integrate the general theory of relativity, 100 years after its formulation by Albert Einstein, with the dynamical simulation of structure formation in the universe. The researchers say that their method of implementing the general theory of relativity is an elegant approach to calculating a realistic distribution of radiation or very high-velocity particles in a way that considers gravitational waves and the rotation of space-time.